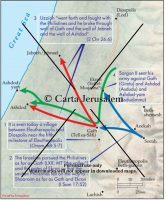 The personal conflict between King Saul and his protégé, David, is the topic of several chapters in the Book of Samuel. 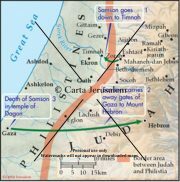 Jacob and his sons were allowed to settle in a choice portion of “the land of Ramesses” (Gen 47:11) called “the land of Goshen.” The city of Ramesses (Egyptian: “the House of Pr- Ramesses”) was built on the former site of the Hyksos capital, Avaris. It served as the northern capital for the pharaohs of the nineteenth and twentieth dynasties. Saul was the last of the judges and the first of Israel’s kings. 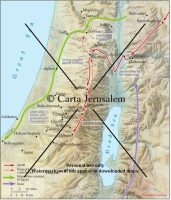 Saul not only delivered Israel from the Philistine yoke, but also warred upon all the other surrounding enemies, and he “delivered Israel out of the hands of those who plundered them” (1 Sam 14:48). 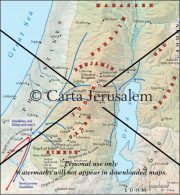 The rebellion in the Kadesh-barnea area was a paradigm of national rebellion in the cultic and religious traditions of the monarchial period (Num 20:13; Deut 33:8; Ps 81:8, 95:8, 106:32). Unlike the narrative about Abram, that describing Jacob’s return from Paddan-aram is quite explicit. 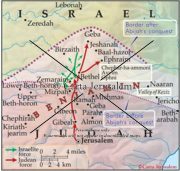 The newly established kingdom of Israel is depicted in the census ordered by David. 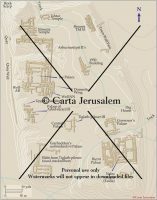 The territory covered represents all of the area directly under control of the monarchy in Jerusalem. The Samson cycle of heroic legends (Judg 13–16) concludes the circle of narratives about charismatic leaders in the pre-monarchic period.